Each suite comes complete with its own plunge pool and outdoor shower overlooking the vistas of hills, waterfall and river! Mkuze Falls is actually quicker to get to from Johannesburg than most of the greater Kruger reserves – so if you fancy something completely different, then add it to your “must visit” list soon! Experienced rangers and trackers will do their utmost to track down the Big Five for you – and each game drive comes with the bonus of the stunningly attractive and varied landscapes that you’re driving through! No indoor showers, only the outside shower which can be a less attractive prospect if the weather’s chilly – then again you can then just take a long, warm soak in the tub! 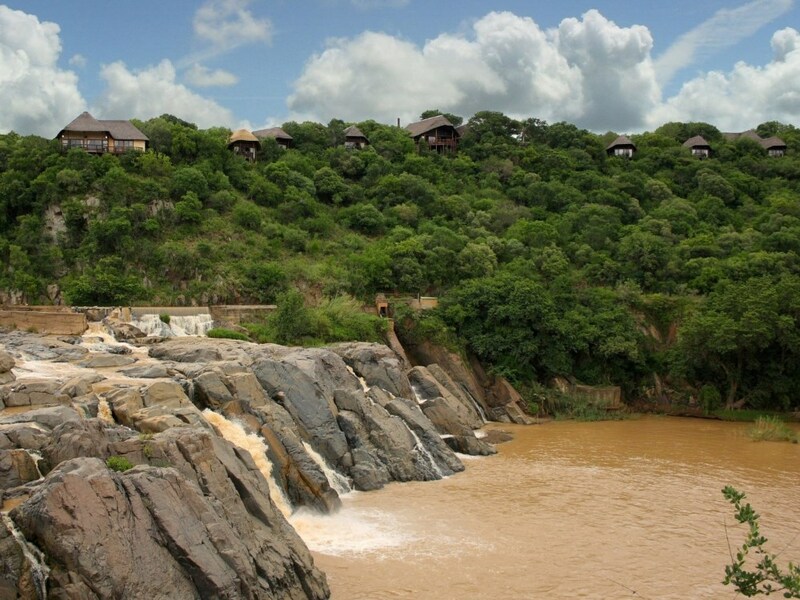 In the far north of Zululand lies the Mkuze Falls Private Game Reserve (not to be confused with the provincial reserve called Mkuze) Here the Mkuze Falls Lodge lies located along the northern bank of the Mkuze River in the heart of the reserve, where it overlooks a stunning waterfall (during the wetter months that is!) In fact that’s not the only scenic highlight, as this 10 000 hectare Big Five reserve boasts a diverse variety of stunning landscapes – from a stunning gorge through which the river flows, to thickly wooded hillsides to wetlands that attract a plethora of birds. If you’re based in Gauteng, the immediate thought when most people think about heading off to the bush for a break is to hit the road to the lowveld and the various reserves that make up the Greater Kruger area – but interestingly it’s actually quicker to travel from Johannesburg through to Mkuze Falls than it is to many of the lowveld reserves! “But why would you want to do Mkuze Falls rather than the lowveld?” I hear you ask. Well for one thing the scenery here in Mkuze Falls frankly knocks all kind of spots off what the greater Kruger area has to offer! Then there’s the gorgeous sub-tropical climate of northern Zululand which makes coming here, especially in winter, a pleasure. 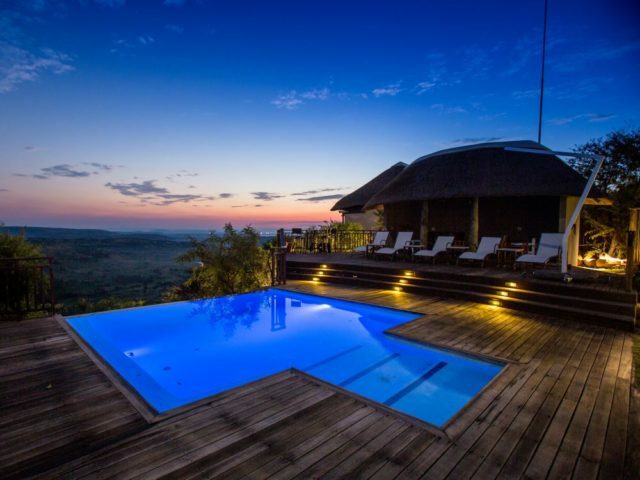 Being so close to the beaches of KZN also means that you’ve got the chance to do a bush ‘n’ beach combo should you wish, perhaps with one of the stunning beach lodges in the area like Thonga Beach Lodge. Of course there’s the game viewing itself, with Mkuze Falls boasting excellent Big Five game viewing with lion and rhino in particular offering excellent sightings – this is also a huge hotspot for birders, particularly in the summer months when all of the migrants are present. 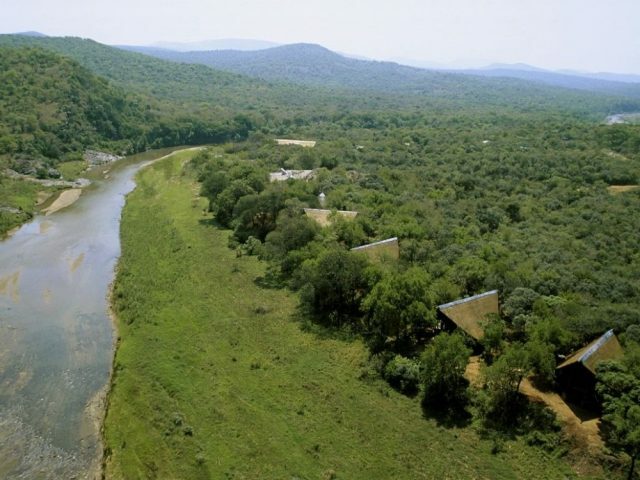 And finally there’s the lodge itself, with its unique and quite spectacular waterfall location unrivalled by anything that the lowveld game lodges are able to offer! 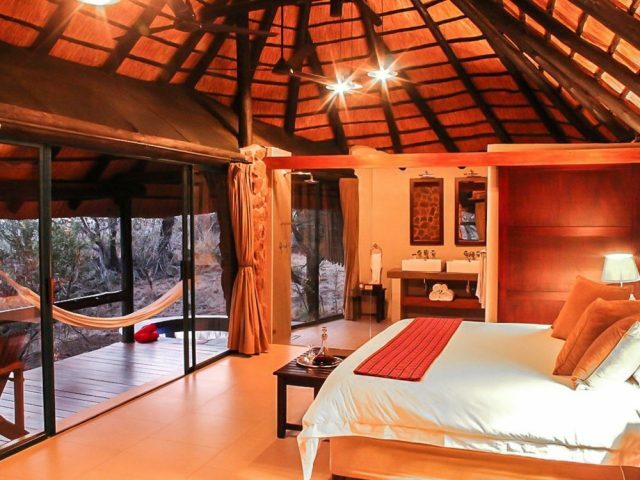 Mkuze Falls lodge consists of 9 thatched chalets, one of these being the larger and more luxurious Safari Suite which has an added lounge area for you to relax in (we were lucky enough to stay in this gorgeous Safari Suite!) The rooms stretch out along the crest of the hill, flanking the main lodge building on both sides and all have been constructed on raised wooden platforms built on stilts so that they jut out from the steeply sloping hillside. 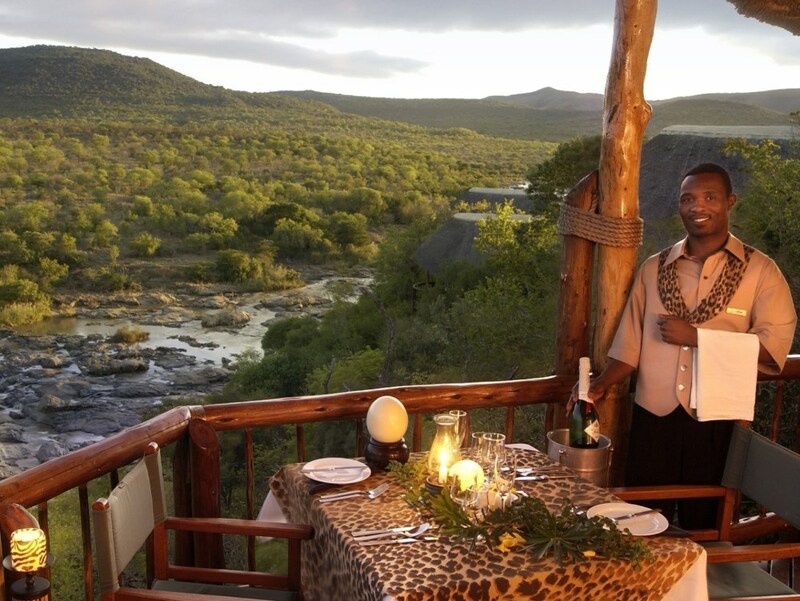 Whilst the spacious deck of the main lodge building probably enjoys the most spectacular views of the falls, each of the rooms also has a wooden deck area which provides breathtaking views of the Mkuze river, the waterfall and the surrounding hills – you can even lie on your bed with the sliding doors of your suite thrown open and spot game on the opposite hillside through binoculars. The décor of the suites is very much the traditional game lodge feel with solid wooden finishes and a nostalgic colonial safari ambiance – if you’re a stylista you may find them a little on the old fashioned side and yearn for something a bit more edgy, but we thought they were really charming and attractive and will suit those who prefer more traditional game lodges down to the ground. Being standalone rooms there’s no lack of privacy either with each room having its own entrance and offering en-suite facilities with a secluded outside shower and private plunge-pool the highlights! After all there’s little that can touch the feeling of freedom that you get when showering under the wide open African sky! They’re also a great way to feel refreshed during the heat of the summer days if you don’t fancy utilising the normal air-conditioning. We also loved how after your game drive you would come back to a drawn bath – pure indulgent pleasure! The main lodge area has a similar traditional game lodge design with the highlight being the lovely wooden viewing deck that opens out from the lovely lounge area. Alongside the bar and dining area there is a swimming pool and the whole ambiance is very relaxed and peaceful. Whilst it’s a tempting prospect to just hang around the lodge enjoying a cocktail around the pool or snuggled up on one of the comfy sofas in the lounge reading a book, it’s definitely worth heading out on the twice daily game drives with your eagle-eyed ranger and tracker. We enjoyed some great sightings, with just the ever-elusive leopard letting down the show on our stay – from being mock charged by 3 young and very cheeky lion brothers, to being in the midst of a breeding herd of elephant, to excellent sightings of white rhino, including having a mum and calf running alongside our vehicle for a couple of hundred metres! The reserve is also proud of its cheetah whilst you’re likely to see more nyala here than you’ve ever seen before. Birders will also delight in the huge number of birds attracted to the reserve’s wetlands, especially in the summer months. All in all Mkuze Falls adds up to a very attractive (but probably little considered before now) reserve option which definitely deserves to be added to your bucket list!